WILLEMSTAD - Contradictory statements and personal accusations against each other were the last drop for Minister Suzanne Camelia-Römer. Minister Camelia-Römer of Health, Environment and Nature (GMN) yesterday gave the representatives of Sona, Ballast Nedam and Berenschot a hefty sweep. She is really fed up with them. 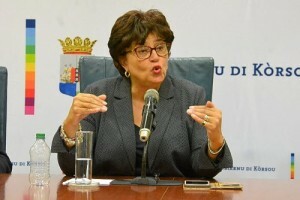 Camelia-Römer also spoke about the 31 million dollar lien placed on SONA with Curaçao as the liable party. Rene Overdevest of Ballast Nedam announced in parliament that the lien was placed for ‘work still to be done’. There was - among other things due to media reports - feared for the financial situation of Sona and, therefore, Ballast Nedam decided not to wait any longer to place the lien. Minister Camelia-Römer says that it is not the correct way to communicate with her, through the media or letters to parliament or take such positions as placing a lien with the government as the liable party. Ballast Nedam could have asked for a meeting with the government. The government will honor all claims provided there are proper financial documentation. “And no one has any doubts about that. This country is not a banana republic, it is a country of order,” said the Minister in her intervention in parliament. The Minister thinks that Sona should demand the lifting of the lien and warns Ballast Nedam that no money will be spent on activities that have not been carried out.